Medieval Chainmail Armor for SCA, Renaissance Fairs and Medieval Events.Our chainmail is battle ready and a necessity for all Knights. Get yourself a full suit of chainmail armor. 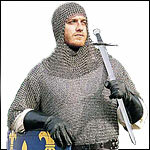 We have Chain Mail to cover all parts: Chain Mail Coifs, Chain Mail Hauberks, Chain Mail Mantles and Chainmail Chausses. Our chain mails come in Carbon Steel, Stainless Steel, Aluminum, Brass, Copper, and Blackened Steel. They also come in a variety of styles: Flatten, Butted and Riveted Mail. Our chain mail coifs provide head, neck and shoulder protection, while or chain mail hauberks provide upper body protection and arm protection. Chain mail chauses provide protection for the thighs, knees, and the lower leg. Mail Leggings are Mail protection for the full lower leg and the front of the thigh. Chainmail leg armor was also known in the middle ages as maille Chausses. We also offer Chainmail Mitten Gauntlets. We have Mail Coif, Skirts, Chainmail armor. Mail coifs, voiders (under arm armor) and skirts, in aluminum, mild steel rings and titanium. In our Chainmail Shirt section we have Chainmail Hauberks and Chainmail Haubergeons. From the Celts and Romans to the knights of the middle ages, Chainmail armor was one of the most prized items a warrior could own.